Transcript of BriefingsDirect podcast with Hewlett-Packard on series of Sept. 2 announcements on enterprise virtualization products and services. Dana Gardner: Hi, this is Dana Gardner, principal analyst at Interarbor Solutions, and you're listening to BriefingsDirect. Today, a sponsored podcast discussion about the growing and important topic of virtualization -- at multiple levels in IT organizations, that is to say, for applications, infrastructure/servers, as well as for clients and desktops. We're going to talk about services and products in the marketplace, along with the demand and the economic and business payoffs that virtualization is already bringing to many companies. We expect virtualization technologies and techniques to bring even more productivity gains in the near future. We're here with Greg Banfield, consulting manager for the HP Consulting and Integration (C&I) Group infrastructure practice. Welcome to the show, Greg. Greg Banfield: Thank you very much. Gardner: Dionne Morgan also joins us. She is the worldwide marketing manager for HP’s Technology Services Group (TSG). Welcome, Dionne. Gardner: And we have Tom Norton, worldwide practice lead for Microsoft Services at HP. Hello, Tom. Gardner: Virtualization, of course, has been with us for quite some time. The technologies of virtual machines and hypervisors have been around for a while, but this is really starting to gain ground for a variety of reasons. In many organizations, there are economic reasons, technology reasons, and business outcomes reasons. People are finding that getting higher utilization is the only part of the story. We're also finding that virtualization is taking place in the context of larger IT undertakings, be it data center consolidation, application modernization, services oriented architecture (SOA), business continuity, and energy savings, just to name a few. I want to start out by talking with Greg about "why now?" Why are the market and HP focused on virtualization as such a significant development in the market at this point in time? Banfield: It comes down to a few things. It comes down to our customers asking what HP has done within our own data centers, and how we have done it, because we have gone through the transformation ourselves as a company and have gained a lot of experience around that. It also comes down to a few things in the economics around cost, cost of labor, cost of machines. The price of machines is going down; power is coming up. They're looking into getting a better handle on using those servers, and using the access they have, and trying to fully utilize them to make sure that the applications that they serve within their company and with their users are fully utilized, and to take advantage of the new servers and technologies that are coming out today. Gardner: Now, HP is in a unique position in that it has hardware, services, clients, software infrastructure, software management, and partnerships across multiple providers of virtualization technology. This seems to be almost a ready-made business with IT development in the marketplace. Tell us how HP views this opportunity as a company. Norton: What’s interesting about virtualization is that, as companies have started to work with virtualization, the easy assumption is that you are really reducing the numbers of servers. But, as you expand your knowledge and your experience with virtualization, you start looking at comprehensive components in your environment or your infrastructure. You start understanding what storage has to do with virtualization. You look at the impact of networks, when you start doing consolidation in virtualization. You start understanding a little bit more about security, for example. Also, virtualization, in and of itself, is really allowing you to consolidate the sheer number of servers, but you still have the idea that each of those virtual servers needs to be managed. So, you get a better view about the overall impact of device management, as well as virtual machine management. HP is unique in that ability to be able to understand it from a client perspective, from a server perspective, and, as I mentioned, storage, software, networks. It’s actually a tremendous opportunity for HP to work with our customers to give them an overall strategy of how all of those components work together to deliver the value they are looking for in virtualization, to look at cost, and, as you mentioned earlier, to look at flexibility, security, disaster recovery, and rapid presentation of application. We are in a unique position in the industry to be able to help our customers address all of those issues, which have an impact on virtualization. Gardner: Virtualization, of course, has been targeted largely at individual server farms or data centers, but, as we are describing it, it really does impact quite a bit across the board for IT. I'm also wondering what the impact is on the business. Let’s go to Dionne. What are the business outcomes, values, or productivity benefits that virtualization supports and underscores and that help the IT people make the case for this investment? Morgan: One of the key areas is cost reduction. Virtualization can help with major cost savings, and that can include savings in terms of the amount of hardware they purchase, the amount of floor space that’s utilized, the cost of power and cooling. So, it improves the energy efficiency of the environment, as well as just the cost of managing the overall environment. A lot of customers look to virtualization to help reduce their cost and optimize how they manage the environment. Also, when you optimize the management of the environment, that can also help you accelerate business growth. In addition to cost reduction, customers are also beginning to see value in having more flexibility and agility to address the business demand. You have this increased agility or ability to accelerate growth. It also helps to mitigate risk, so it’s helping improve the up-time of the environment. It helps address disaster recovery, and business continuity. In general, you can summarize the business outcomes in three areas: cost reduction, risk mitigation, and accelerated business growth. Gardner: Virtualization also adds complexity. When you've got multiple instances running on single hardware, or hardware is virtualized, there is a management hurdle. Bringing this into play across both the physical and the virtual infrastructure is also another management hurdle. I wonder if any of our panel could help me understand a little bit more about doing this the right way from a management perspective. Norton: What’s interesting about this is that when you get into a virtualized environment, there's a need to understand the heartbeat of the virtualized environment and understand what’s going on at the hardware level. As you grow up from there with the virtualized machines, you have to understand how the virtual machines themselves are performing, and then there's got to be an understanding of how the actual applications are performing within that virtual machine. So, management and virtual machine management, overall a comprehensive approach to management, is critical to being successful. One of the other areas that is addressed through management -- as well talked about a lot -- is virtual machines sprawl. Organizations have gone into virtualization with the hope of reducing the number of servers that they manage in their environment. They turn around with a reduced number of physical devices, but they actually end up with more servers. The control of virtual machines is less difficult, which is a good thing, because you have more flexibility. It also can become a burden, because you can quickly lose control of the sheer number of servers, and, the work that goes into managing those servers during patches, upgrades, and the security issues that go along with it. So, virtual machine management is actually the key contributor to all this. When you think in terms of that, you really have to think in terms of both the actual management of the machine, the physical device, and understanding the utilization of a processor, the health of the computer itself, and then understanding the health of the virtual machines that sit up on top of it. HP has a unique ability, because we've been working with virtualization since the 1990s. We've been working with virtualizing and understanding the physical nature of the devices for years, and our engineering groups now have invested a lot of time in working with our partners -- VMware, Microsoft, and Citrix -- to understand their virtual machine management and how our tools and their tools can work together and become integrated to provide that comprehensive view that is required now to really properly manage virtual machines. Gardner: And, we're talking about a heterogeneous environment from the start with this. According to analyst reports, some 80 percent of enterprises are using virtualization on multiple platforms, with half using three or more platforms. So, this really becomes a critical management issue from that perspective. Let’s go to Dionne and talk about what HP is calling a rethinking of infrastructure. We've talked about the paybacks as an economic incentive, an agility incentive. Organizations can use virtualization to support and augment some of their ongoing work towards consolidation, unification, modernization, part of the IT transformation in a long-term trend, but you are thinking that this is also a milestone at this point by rethinking infrastructure. I wonder if you could help us understand what you mean by that. Morgan: Organizations need to think not only about their servers, their storage, and their network for the virtualization perspective, but to look at this from an integrated perspective and have an integrated management view of the data center. It’s not just about the technology. They also have to think about this in terms of the people, the processes, and the technology. Tom was describing how we can help manage the physical and the virtual. In addition to that, we also need to look at how we manage the ongoing processes, which are going to be responsible for "operationalizing" the virtual environment. This could include the adoption of key industry best practices and standards. Some best practices that come to mind, are what come from the Information Technology Infrastructure Library (ITIL), how you actually use these ITIL processes, and how you take it a step further and automate some of those processes. It’s an industry best practice for managing services that you deliver to the business. It’s very important to look at the technology, both the physical and the virtual, the processes required to manage, the automation of processes to manage the virtual environment, and also the people within your organization, ensuring that they have the right skill sets and the right information to utilize and take advantage of this virtualization investment. Gardner: Let’s take that point about personnel to Greg. Tell us about what the skill sets are? It sounds like this is a bit different. Is there training and the ability to bring your staff or IT operation staff up to spec on this? Is there a too much of a demand in the field for people and personnel with experience? What’s the outlook for the human resources aspects of virtualization? Banfield: That’s a great question. One thing we have heard from the consulting side is that people understand, customers understand, and CIOs understand about the cost savings and those types of things. What they are asking us, when we go and do these things, is "I understand we are going to save money. I understand my server count is going to go down. What I am struggling with is people and the processes. I have many processes to handle within my infrastructure and people, and I need to get them redeployed or re-energized into other things that will actually generate growth for our company, as opposed to just shepherding servers now as administrators or other types of things." From that perspective again, ITIL, as we just mentioned, is a great tool that we can use in the processes. From HP’s perspective, our consultants have done this many times in house and with other customers. We bring to the table the know-how from doing this before, doing transportation projects that we can help the customer move from where they are today to where they need to be in a virtual perspective. It's not from the infrastructure so much, although we can do that, but the bigger piece is how do we get where we are today, with our processes and people, to where we need to be from an infrastructure standpoint in a virtualized world. So, yes, our folks are trained. We have many certified people on ITIL, virtualization, and our partner certification VMware and Microsoft. It’s a great opportunity for our customers to work with HP. We have a wealth of knowledge, both from a training perspective, from practical know-how, from just doing it before. Gardner: I think we have a sense of the vision here, the promise, and also some of the challenges. So, HP on September 2 came out with a number of announcements, some methodologies. We are looking at virtualization from a strategy perspective, design perspective, the transition and integration basis, and then ongoing improvement and return on investments (ROI). Let’s look at the first two, strategy and design. What we are talking about in terms of the September 2 announcements on virtualization in regard to strategy and design? Norton: Strategy is becoming even more important. Our customers are very aware, as everyone else is now, that they have many options available to them as far as virtualization, not only from a perspective of what to virtualize in their environment, but also from a number of partners and technology suppliers who have different views or different technologies to support virtualization. Our customers, from a strategy and design perspective, have looked to us to provide some guidance that says "How can I get an idea of the net effect that virtualization can have in my environment? How can I present that and gain that experience, but at the same time understand my long- term view of where I want to go with virtualization, because there is so much available and there are so many different options? How do I make a logical and sensible first attempt at virtualization, where I can derive some business value quickly, but also match that up against strategy for a long-term vision?" What we are trying to supply with these new services around virtualization is the idea that we can provide our customers with a strategy and a short-term proof of concept, or short-term, rapid, or accelerator, implementation of virtualization. Whether it's on the desktop side or on the server with Microsoft’s new Hyper-V, to give them that experience, they can have that experience contribute to a long-term vision as far as that long-term infrastructure design. What we are trying to look for is taking the complexity out of an introduction to virtualization. We're trying to take the complexity out of the long-term vision and planning and give the customers an idea of what their journey looks like, rapidly introduce it, but in the right direction, so they are following their overall vision in gaining their overall business value. Gardner: It sounds really important to bring all of the numerous aspects of IT that are affected by this onto the same page, under a road map with the same vision, and then get into a lifecycle perspective. Now, once we've got our vision, we have our perspective, and we have got all the people on board, it’s down to brass tacks, and then transition and integration. Greg, what’s in store for the HP community, vis-à-vis, this level of the deployment? Banfield: Then, we would have our HP services consultant in integration come in and work with the customer. We've gone through the design phase and the strategy phase, and now we work with the customer to take what we've got on paper and get it going. Typically, we do something in a phased approach, because we're talking about some very large projects. As we've talked about for last 20 or 25 minutes here, it’s a complex environment that we're dealing with. We're dealing with multiple vendors, multiple business groups, and multiple applications, everything impacting a different thing. We have the design, so we actually start going. We have solution architects and project management using best practices, working hand-in-hand with the customer to make sure that, as we go through this, and there’s changes involved, we are on track. Of course, as you go through these projects, you have to keep going back, as Tom was mentioning, to your original strategy and your original design, and keep checkpoints. Are we still meeting the criteria for the business? Are we still taking what we have learned during the first two phases, its implementation, and the transition integration valid? We keep reassessing, as in any large project we go through or anyone we would do. You validate against your milestones and checkpoints and then make adjustments as needed. Gardner: And then, Dionne, as you mentioned earlier, the business outcomes are important, and the improvements in ROI come into play. So, it’s not enough just to deploy and sit back and wait for the benefits with virtualization. This is an ongoing process, very dynamic, changeable. I think one needs to tweak and manage their resources to improve that productivity to get that economic return. Can you tell us little bit more about what HP has in mind for this long-term economic value? Morgan: Once you actually transition your solution into production, you have to look at the ongoing operations and the continual improvement of those services that you are providing back to the business. In terms of the ongoing operations, you have to continue to assess your people's skills and your operational processes. HP provides services to assist with its ongoing operation to help to increase the stability of the virtualized environment. That includes everything from education courses, to software, technical support services, and hardware support services. We also have proactive services, which are really focused on that continual improvement phase of the lifecycle. On a regular basis, we assess what’s happening in the organization from a people, a process, and a technology perspective. We benchmark against what’s happening in the industry, making recommendations on where a customer can actually improve, on some of those processes to improve efficiency, and to improve on the service level they are providing to the business. We also assist with the implementation of some of those process improvements. If you look at this from a full lifecycle perspective, HP provides services to assist with everything from strategy, to design, to transition, to the ongoing operations and continual improvement. Gardner: It was mentioned earlier that HP has gone about a good deal of this virtualization transformation itself. It also worked with some leading-edge customers to deploy and refine. Do we have any metrics, do we have any view into what this means in terms of payback? Is this iterative, minor, 10 percent? What kind of payback typically are we starting to see from a well-planned, well-organized, well-implemented virtualization strategy? Norton: I don’t know if every company is going to be the same as far as what they may desire to achieve. We've had examples of customers. Greg’s group worked with a financial organization through an accelerator service, in other words going through the whole strategy and discovery phase and trying to measure their environment to look at capacity. They have seen reductions to go from 300 to servers in their environment to 30, at least in the sample of servers that have been evaluated. That’s just one customer’s example, and everyone could potentially be different, but the idea is just the same. You can look at the number of physical devices and go through an analysis that will look at how these applications can be virtualized and what the utilization of the equipment is. You can have a simple reduction in the number of devices. HP will also, like our own organization, look at the actual application that’s being virtualized. Maybe it’s not just the case of reducing the number of physical devices and having the same number of servers running. True savings come in when you’ve decided to reduce the number of instances of an application that maybe running on servers. You can add this sense of application virtualization. The classic example in those cases is an organization that may have 200 remote Microsoft Exchange Servers in their environment. They can look at bringing those distributed remote workstation into a data center environment and find cost savings in administration and data protection. But, there’s still a huge expense in how those Exchange Servers are still sitting on virtual machines. So you still have 40 Exchange Servers and you are still managing each one of those. Another saving gets involved in that too, where you decide, "I am actually going to reduce the shared number of that 40. I may reduce my Exchange Servers from X number of devices to a quarter of that." Then, you still have those devices that reduce the number of Exchange on servers running within that consolidated environment as well, and that dramatically affects that kind of cost saving. Cost savings vary, but it can be dramatic. It can be as dramatic as CAPEX expenditures in the hardware base and it can be very dramatic from an application-management perspective or a server management perspective. Organizations now are looking, like HP did, in both areas, reducing the shared number of physical devices in the data center, and reducing the number of instances of an application that are actually running on servers to provide you even greater benefit. Now, we are able to use virtualization to refine these supply-and-demand equations, so that we can pull resources at the infrastructure level, pull resources at the application level, and reduce a lot of waste and unnecessary or underutilized resource. Banfield: Another thing that Tom was hitting on, besides this physical savings of the environment with power and air conditioning and things like that, is agility -- agility to market. As Tom was saying, you can now move applications and other things around. Your workforce becomes much more agile to address critical business needs in a very timely manner with virtualization. I think that’s key to our customers. Gardner: So, if we want to move a whole new set of application to our Asia-Pacific operations and target a whole new set of customers there, the ramp up to doing that is much less time and much more something you can manage, rather than have to forklift upgrade, is that correct? Gardner: As an analyst I get some questions frequently, and one of them I have to throw out to you guys, because it’s sort of an obvious one. Why would a company that makes a significant amount of money from hardware want to reduce the number of hardware instances? How does that help you, or what is the long-term implications that I am missing? Norton: What happens is, as you are going to change in a platform, when you move from, say, individual instances of a device that sits in a branch office some place, and it’s maturing and it’s isolated, it’s disconnected in essence, because it’s separate from all the processes that have in the data center. From a hardware perspective, it’s a great opportunity for HP, not only because we are changing some of these legacy platforms, as they will be sitting out in these remote offices, but we are enabling our customers to actually run on a much more effective and newer platform. It's a much more powerful platform, with direct connectivity to more powerful storage systems, and more powerful networks that run in datacenter. It’s a plus for both. Our customers gain an advantage, because there are going to be savings overall in how much money they spend on that old equipment, how much maintenance cost they have, how much systems management they need to do for this device to sit out there or even sit in their data center, and have to be supported in much less efficient way. We can save them money by moving them to more powerful, more efficient platforms. At the same time, it allows us to introduce our customers to these new devices, that provide them a wealth of benefits, from the performance perspective, on security, stability, and high availability. It’s a win for both organizations, along those views. Gardner: Okay, let’s look at the actual announcements of Sept. 2. I'm going to break out one first, and that’s the desktop virtualization announcements -- virtual desktop infrastructure (VDI) solutions services, using Citrix XenDesktop. Again, we're looking at a pretty radical shift in the types of end-user devices. We could start using some thin clients, and there is a security and risk reduction opportunity for bringing the data and applications-configuration information onto the server. The end users basically have a seamless environment. They're getting the same desktop and operating system that they’re accustomed to. There are tremendous opportunities to save costs here. Let’s look before we drill into each of these announcements. Let’s just break out desktop, the virtual desktop and the infrastructure set. Tom, let’s go to you on that first. What’s the big deal here? What are we talking about, when we are going to reduce the amount of actual client-side activity vis-à-vis virtualization? Norton: When our customers sit down and do a study, we help them look at the cost of managing client or end user devices in the field, not only from a help desk study but from a productivity study, from an application presentation viewpoint for the end user, the applications that they use and how they are presented is the heartbeat of business. The data that they use is so sensitive, and so important to the organization as a whole. When they need help in keeping their productivity up, it can cost money or it can save the organization money. So, you look at changing somebody from a very insecure, volatile device in a remote environment that they use on a daily basis. Gardner: So a local laptop for example. Norton: A laptop, right. You can still create that rich experience that they are used to, but give yourself the security of knowing that the data that they are using is protected from theft and also protected, as far as archiving and search availability, from governmental regulations. They can give users some of that rich experience, but still have that protection. You can look at that device and understand the cost and complexity of either upgrading the device, presenting an application, or deploying an application to that device. It’s extraordinarily expensive to do that and, if they can still get the experience of a more rapid presentation of the applications that they need to their job on a daily basis, both of those are incredibly valuable to the organization. If you can get those two advantages, you are going to reduce help desk calls from your end user in the case of a disaster. If you have a notebook and it fails, for example, how do you get that person back up in working again, access the data they need, and access the applications they need? You can accelerate that recovery. You are receiving enormous amounts of management and spending enormous amounts of money on every device every year. You can accelerate recovery and provide them the same rich experience that these new technologies allow us to do. If you look at a virtual device now, you can say to the end user, "You will get the operating system that you need. You will get the application that you need. And, it will be in the environment that you expect to work in. You have the same user state you have had." If you can combine all three of those in a virtualized environment, you are actually, in the end, providing more productivity for the end user, and, at the same time, cutting the management cost. You're also enabling yourself to cut other support costs in the organization, like how much money you spend to protect data, how much money you spent to restore data, or protect it from theft. So there are enormous advantages to both, but it doesn’t work in every instance. If you have remote users who don’t have daily or hourly connectivity back to a host, it may not be to your advantage to use this technology there. But, for most organizations there is certainly a large part of their population that can take advantage of the technology. Gardner: We've already seen a lot of this in use in some government organizations, particularly in intelligence and military communities, where they can’t take the risk of having an end device being lost or falling into the wrong hands. So, the stateless approach to computing is quite popular and proven there. Isn’t that right? Norton: Right. You have a public sector, which is very sensitive, but you can imagine the same in terms of healthcare and financial organizations. You can extend that idea. It may not just be sensitive data. It maybe repetitive tasks or frequent upgrades of applications. You have large segments of users who would have redundant equipment, and they have no need for a rich experience, but they may need an application refreshed on a predictable basis. This allows you to do that gracefully. Gardner: Once again, this strikes me as aligning supply and demand -- what the end user actually needs in terms of resources, versus having the equivalent 20 years ago with a supercomputer on every desktop. Gardner: Let’s go to these announcements one by one very quickly, so we can give our audience a sense of the breadth and depth of this wave of addressing the virtualization issue. The first is HP Virtualization Accelerator Services. Greg, can you tell us quickly what this means? Banfield: As we talked about, virtualization is a lifecycle, a journey. HP has Accelerator Services, which are predefined services from the consulting organization for customers to plug-in their module, to plug into where they are within their lifecycle. Because this is a lifecycle, customers could be at any point there, whether design or strategy. Maybe they're just starting, are half way through a project, or maybe towards the end of a virtualization project. As we talked about, maybe the business outcomes weren’t exactly matched up with the original design, and they need some help in that area. Consulting integration comes with these Accelerator Services to help the customer through those difficult times or any point in the lifecycle to make sure that they are gaining the full value from their virtualization journey. We can talk about each individual package, if you like, or a service, as we move forward. Gardner: We'll come back to the services once we get through the major elements. There are also the VDI services that we just discussed. I’ll just touch with Tom one more time on that. It seems to me also that with desktop virtualization, they were sort of getting the best of the old and the new. The old paradigm was centrally organized and managed, even back in the mini and mainframe days. There were a lot of benefits to the organization for doing it that way, but the end user didn’t get the flexibility, the innovation, the freedom and flexibility, and so forth. Now, we're able to blend the two of them to get that centralized benefit for operations -- upgrades, maintenance, management, and aligning the supply and resources with the demand of the end user much more efficiently. At the same time, we're giving users a Microsoft Windows desktop, where they can pick and choose, move, and get a lot of resources still using a browser. Am I off base here or are we really looking at the best of both worlds? Norton: Absolutely. It does a number of things. Everybody uses PCs at home. The generation we are working with now has grown up with that equipment, so they are very accustomed to having a personalized work environment. They are used to having some flexibility to obtain applications and run them on their own devices. They are accustomed to performance and also access to data, not having to wait for access, not having to wait for what historically has been a very slow change management process on mainframe based systems to add an application or change an application. They are used to that agility, to that that high frequency of change. Up until now, many people have been resistant to make that move, because they don’t want to have that rich experience impacted. Now, you get that great benefit of having the rich experience, but, at the same time, you have the ability to take advantage of what consolidation means -- the predictability, disaster recovery, security, those types of developments which you never could get before in a more unpredictable world. Through VDI, you really get that idea that you have the best of both, from a consolidation perspective as well as distributed to computing perspective. We feel we are satisfying both ends. When we look at VDI, it’s kind of interesting. It touches both the back end systems and it touches the end user client. Sometimes with virtualization, people just think in terms of that back office, the server room, the datacenter transformation idea. With VDI now, you have taken it and bridged that gap, to where you can do things on the desktop side, as you mentioned earlier, about taking advantage of thin clients. 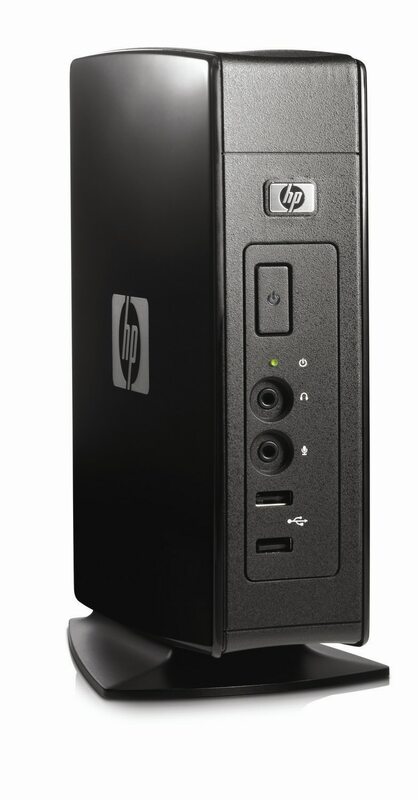 HP is producing some great thin-client technology. You can extend the life of current hardware, if you wish. If you're mid-term in the lifecycle of a notebook or desktop, you are not really ready to retire it yet, but you don’t really want to spend a considerable amount of money to upgrade. You can extend the life of that device and make it more useful by combining that device with this type of technology. At the same time, if you have a high performing device, this gives you the flexibility to just virtualize one application out to that device. So, it gives enormous flexibility on the front side. On the back side, in the datacenter play, it allows you to do a lot of things. You can take advantage of all the benefits of blade technology, that whole idea we've discussed before about storage, virtualizing storage, and having better access to available storage. You may run out of storage on a notebook device, but you can request and expand your storage capability on a storage area network (SAN) and go forward from there. So it’s unique in that it can address both the client side, the end-user facing side, and the efficiencies, and predictability, and performance that you want in a datacenter. Gardner: Part and parcel of virtualization technology is the need for planning and ongoing management and then professional services, methodologies, and best practices. That’s why we have a number of virtualization support services announced as well. I'll run down the list. HP Virtual Server Environment Solution Service. I assume this is about increasing energy, footprint, and resources. HP High-Performance Computing Cluster Management Solution Service, HP Integrity/HP9000 Solution Service, HP Server Solution Project Management, HP Virtual Server Solution Planning and Design, HP Global Workload Manager Solution Services, and HP Virtual Desktop Infrastructure Solution Services. Let’s go to Greg. What are the high points here? We don’t have too much time, so give us sort of an overview what these services involve and how comprehensive they are in terms of the whole series of virtualization opportunities that organizations will face? Banfield: Because we're talking modular, all the services you mentioned are in a modular or tier fashion. Any one of these can be molded to the customer’s need, whether you have 200 servers or 1,000 servers. The tiered approach makes it very easy for the customer to pick and choose what they need, depending on where they are in the lifecycle. They are predefined and data-sheeted, so the customer can read what they're going to receive from HP. These seven or eight different services address different points within the life cycle. All these services do come with project management. Some customers, as I said, are half way through the lifecycle, or on their way, and maybe they just need a little help with project management types of activity. So HP can provide a PMI-certified person to come in there and help them, maybe just work with them to get the project back under control. Maybe it's off a little bit. So any one of these is a great way for a customer to take a look at our solutions. Again, they are couched to be sort of a quick hit, easy to use. You don't have to just pick one service. If you have different needs, you can say, "I need to take the Virtual Server Environment Solution service, and I need Global Workload Manager to create my entire solution." Again, it's easy for the customer to understand, and then move forward with the project. Gardner: Let’s look at how you can get started. These announcements are targeted at the U.S. initially, and you are taking it out globally during 2009, which isn’t that far away now. Tell us how an organization can get started and where they can develop this strategic overview of virtualization? Norton: There are a couple of different ways that customers can engage to get this started. We can engage our customers to get this started first through our traditional sales organization. From a hardware perspective, we have our traditional enterprise account managers and their associated services client principals, the associated services managers who work on those accounts. That’s a very traditional way to engage with our technology teams, who provide these kind of services, both on a support perspective as well as a consulting services perspective. But, there are other ways as well. You can work directly with our Microsoft Alliance members, you can work with our alliance teams. In this case, you're talking about Microsoft virtualization. You can do it from a services perspective. Maybe you can take it from an enterprise account perspective, whether hardware or storage. Those channels should not change at all as far as how you would work with HP from a services perspective to get people to come in. If you look at those services, we set them up too. So, it's very easy for our customers to get engaged. We are presenting services that allow the customer to get engaged, even if it’s a half-day workshop about virtualization. As Greg mentioned, we have strategies that can go two to three days. We have longer term proof of concepts that can go three to four weeks. We try to make it as easy as possible from a services perspective, and also from a sales perspective. We are very flexible. These can even be introduced through our channels, where these can be sold through a channel and delivered by HP. We are trying to provide flexibility, as well as simplicity, in the services acquisition process for our customers, so that they don’t have to worry about who to talk to. When they need to talk, they can go directly to their traditional HP sales force and get introduced to these services. Morgan: If I can also just add to that, once our customers began transitioning into production, they also should think about the people and the processes again. From a people perspective, we also announced on Sept. 2 some new education courses, which tie into what Greg and Tom were just describing. For example, we have an education course on the HP Insight Dynamics BSC software. We have education courses on partition management, and we also announced an HP Virtualization Boot Camp, which covers global workload manager, and virtualization manager, capacity advisor, and a long list of technologies. Customers should really think about getting their people trained in these technologies. And, from an ongoing operations perspective, we also announced some new software technical support services. We already provide a lot of support services in the virtualization area, but what we're adding to that, is support for additional VMware products, such as VMware Workstation, VMware Lab Manager, VMware Site Recovery Manager, as well as the operational support for Citrix XenDesktop Server, and, of course, the new HP hardware, such as the HP ProLiant BL495C virtualization blade. Gardner: Very good. I think we've covered a lot of territory here today, from vision down into actual product and service offerings. Clearly, this is going to be something that companies are going to be dealing with for a long time. We are already seeing forecasts now for virtualization to be growing broadly in the coming year. A 50 percent growth in 2008 alone, and 70 percent just in the previous two years. So we appreciate everyone’s input, and wish you well on this series of announcements. We have been discussing virtualization at the application desktop and infrastructure server levels, as well as the road map and lifecycle management issues associated with that. We've been joined by Greg Banfield, a consulting manager for Hewlett-Packard, Consulting Integration Infrastructure group. Thank you, Greg. Banfield: Thank you for having me. Gardner: Dionne Morgan, worldwide marketing manager for HP’s Technology Services Group. Thank you, Dionne. Gardner: And Tom Norton, worldwide practice lead for Microsoft Services at HP. This is Dana Gardner, principal analyst at Interarbor Solutions. You have been listening to a sponsored BriefingsDirect podcast. Thanks, and come back next time. Transcript of BriefingsDirect podcast with Hewlett-Packard on series of Sept. 2 announcements on enterprise virtualization products and services. Copyright Interarbor Solutions, LLC, 2005-2008. All rights reserved.